I have 15+ Years of experience as Network Engineer and System administrator. I have hands on experience working with variety of networking products from different vendors including but not limited to Cisco, Juniper, Sonicwall, F5 networks, Fortinet, ChceckPoints, Nortel, Dell, HP, MikroTik, Netgear, Watchguard, Vyatta, Brocade, Baracoda, Samsung ubigate routers, Riverbed, pfSense, Cybercoam firewalls. I have good understanding of Virtual Environments & can perform System administrator role as well. 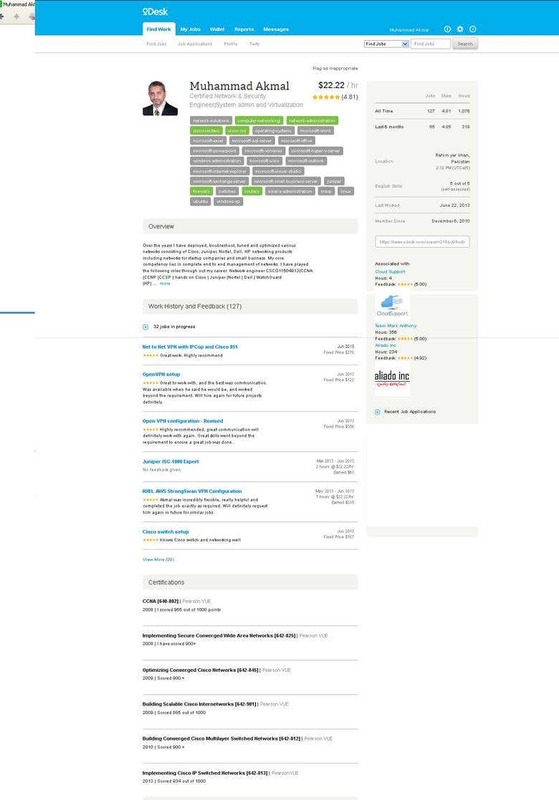 I am kind of “Jack of all trades” I have good experience of connecting remote offices to infrastructure hosted on clouds including but not limited to aws, azure, Rackspace, linode, goDaddy, digitaloceans, I have hands on experience including but not limited to, Microsoft Family of Servers and Client Operating System, Linux Distros, Mac, Solaris. I have hands on experience working with including but not limited to, Solarwinds, What'sUP gold, Opennms, Zabbix, Nagios, Cacti, zenoss. I have rich experience of open source vpn solutions and have hands on experience including but not limited to , openVPN, EthernetVPN, openSWAN, StrongSWAn, Racoom.